Hublot is the latest Swiss watch manufacturer in a long line to team up with luxury car manufacturer Ferrari. High end timepieces have had an amazing history with their associations with luxury car makers. Hublot since its beginnings has strove to be a front runner in the realms of form and function. The same can easily be said of Ferrari, so it is not unfathomable that these too industry leaders have come together to produce a line of watches that have so far proven to be some of the most sought after pieces for this year. The first thing that catches the eye is the unique red sapphire crystal that covers the open-worked dial. The hour markers are comprised of both indexes and Arabic numerals (Arabic numerals on the even positions are stenciled). The rhodium toned markers are applied and satin finished on the dial for a textured look. The hour and minute hands also feature satin finished aesthetics and are also equipped with Super-LumiNova for readability at night. At the 3 o’clock position is the chronograph minute counter, which carries a red hand complementing the chrono seconds hand. Integrated into the chrono minute counter is a date aperture. Through the open-worked dial one can see the self-winding Unico Chronograph Flyback movement caliber HUB 1241. A Flyback mechanism simply allows for the successive timing of events without the need to reset to zero. The Chronograph is also fitted with a column wheel ensuring the smooth start of this timing device. 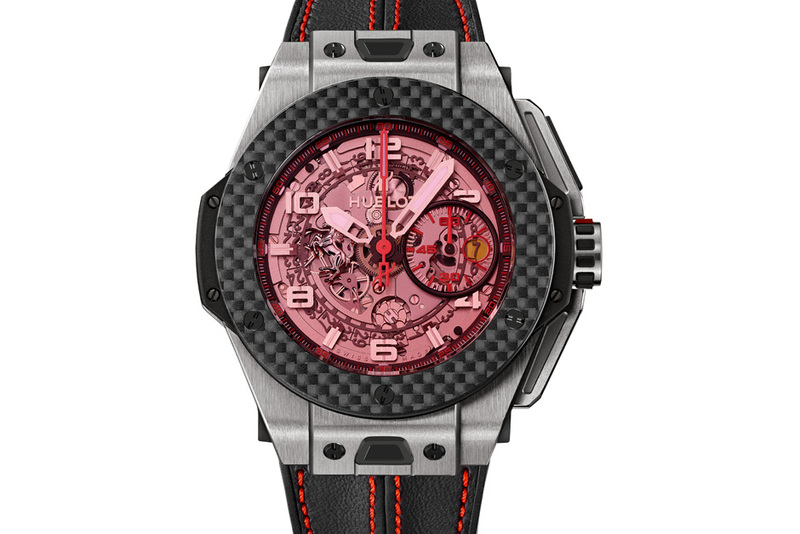 The case is manufactured in carbon fiber, which adds a distinctive sporty aesthetic to this watch. As with all Hublot watches the bezel lugs are crafted from black composite resin. The H screws made form titanium ring around the generous bezel. The strap is made from black rubber and black Schedoni leather, carrying Ferrari red contrast stitching. The strap is secured with a deployant clasp made from black PVD titanium.